Don’t let Chicago’s Brr-rated temps keep you from going out when you could be enjoying beach and equator-like weather and fun. One of the places you can shed coats, hats and gloves and sit in a deck chair is The Beach at Navy Pier. The other place envelopes you in tropical warmth and greenery at The Chicago Botanic Garden in Glencoe. You know you experience is going to be interesting when one of the rules to enter The Beach is to empty pockets of keys, jewelry, phones and fit-bits because they can be lost, not in the sand but in an ocean of a million plastic balls. Play, relax and watch youngsters uninhibitedly dive because this ocean is safe. BTW, no shoes allowed so wear fun socks. 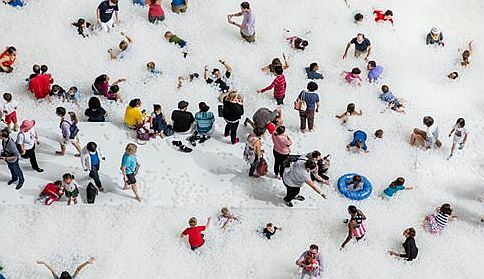 Designed by Snarkitecture founder Daniel Arsham and his crew, The Beach is a fun architectural installation that has gone into an arena in Tampa, a national museum with a large lobby in Washington D.C. and now, the large ballroom at Navy Pier. Opened Jan. 19 and going through Feb. 3, 2019, The Beach is just in time to counteract Chicago’s icy winds. But check rules ahead of time for dos and don’ts such as no strollers, eating or drinking or throwing the balls and do use self-service lockers for valuables. Presented by Navy Pier and Expo Chicago, entry to The Beach is free. For parking fees and locations and public transportation check Navy Pier. To see the Tampa installation visit Youtube TampaBeach. To learn more about the beach installation visit Snarkitecture. Navy Pier is at 600 E. Grand Ave., Chicago, IL 60611. For more information call 1-800 595-PIER (7437) and visit The Beach Chicago. 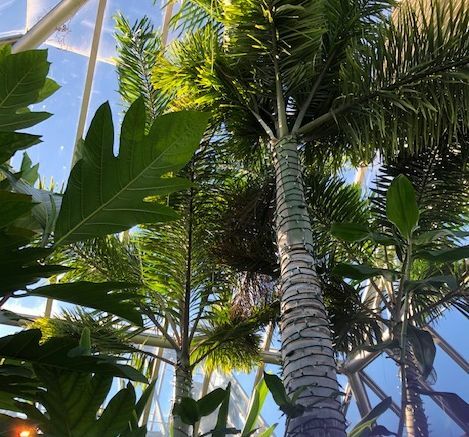 Escape to temperatures between 75 and 85 degrees (Fahrenheit) in the Semitropical Greenhouse surrounded by ferns, delightful gardenia and bougainvillea. Look for penguins and cranes. They won’t waddle or fly off. The Semitropical Greenhouse has topiaries around each corner. Then feel the warmth of the Tropical Greenhouse and breathe in its wonderfully moist air. Look for cocoa pods on the “chocolate tree,” orchids growing on the Botanic Garden’s constructed trees and bromeliads hanging from other constructions. Look for the large leaves and maroon-colored flowers of the banana plants. Go from moist to dry climates in the Arid Greenhouse. Daytime here is really warm between 80 and 90 degrees but when the sun goes down these plants like cold so the temperature drops to half that. Look for interesting cacti shapes but don’t touch. Many of these plants are prickly. Entry to to Chicago Botanic Garden is free. For parking fees and public transportation suggestions (about half a mile from the Braeside Metra stop) visit Chicago Botanic. The Chicago Botanic Garden is at 1000 Lake Cook Rd., Glencoe, IL 60022. For more information call (847) 835-5440.